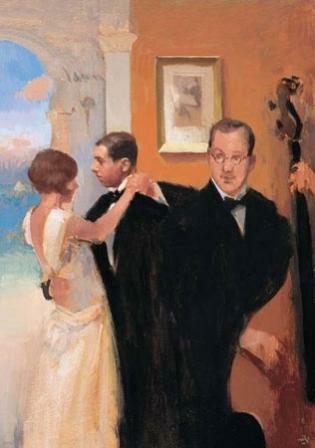 A couple dance in ''The Foyer''. The style of dress suggests a time past and the inclusion of a double bass player signals that a jazz band is playing at the dance. The blue sky and floating clouds lend a timeless quality to this imaginative contemporary art work. Alan Kingsbury has lived and worked in Venice, London, Scotland and ,at present, Cornwall. He has a distinctive contemporary painting style and technique and chooses to paint imaginative subjects. His study and portrayal of light and shade lends depth and interest to his work. In addition to Red Rag British Art Gallery Alan Kingsbury has exhibited at other leading British Art Galleries. Each painting at Red Rag is sourced from the Alan Kingsbury artist studio and like all Red Rag British art and Contemporary art it can be shipped worldwide. Click here to view more contemporary paintings by Alan KINGSBURY.